And now I rejoice in that the second short story for my mini-set is now fully written! Upon finishing the editing and getting a cover, I’ll be making it available on Smashwords for only 99 cents very soon. Those of you who have been waiting for me to put out some new material, thank you VERY much for your patience. I shall be giving more information as things progress! As for Kran, I’m still working away at editing it, and Bherta is continuing to come along quite nicely. I’m beginning to think that I’ll be hitting the market with a double-barrel barrage of new works in the next few months! So hang in there, dear readers! It’s coming! And something that made our night…. Taking another break from writing again (Honestly, I am taking time to write, promise!) to share something that made the night for me and my son. 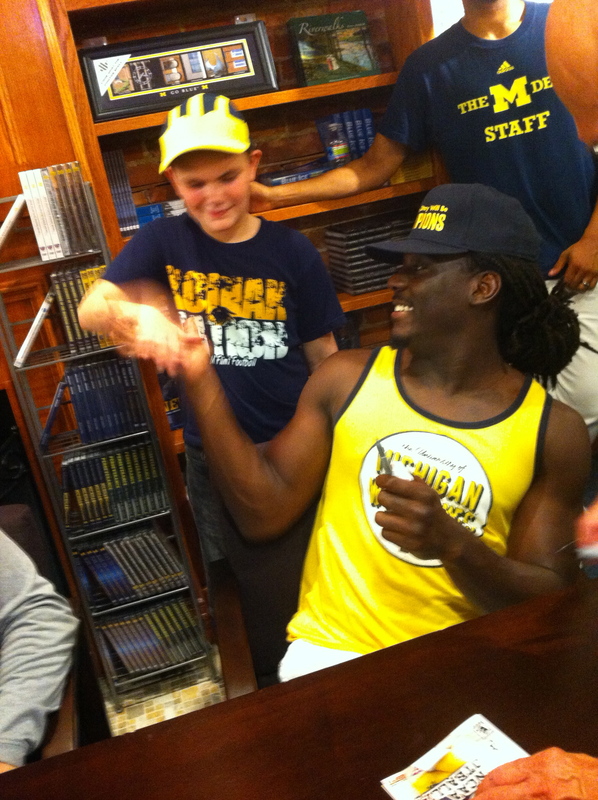 Here are pics taken with Denard Robinson and Devin Gardner of Michigan, done at at the M Dean last night. Also at the M Den were Jordan Kovacs, Marcus Ray, and Mike Martin. Being the football fans we are, and seeing as how that pic you’re looking at with Denard giving my son a quick hand slap geeked him out for the rest of his life, I had to share this with everybody. All this to say that bringing joy to a kid’s face, and especially the face of your own children, is a wonderful thing to do. 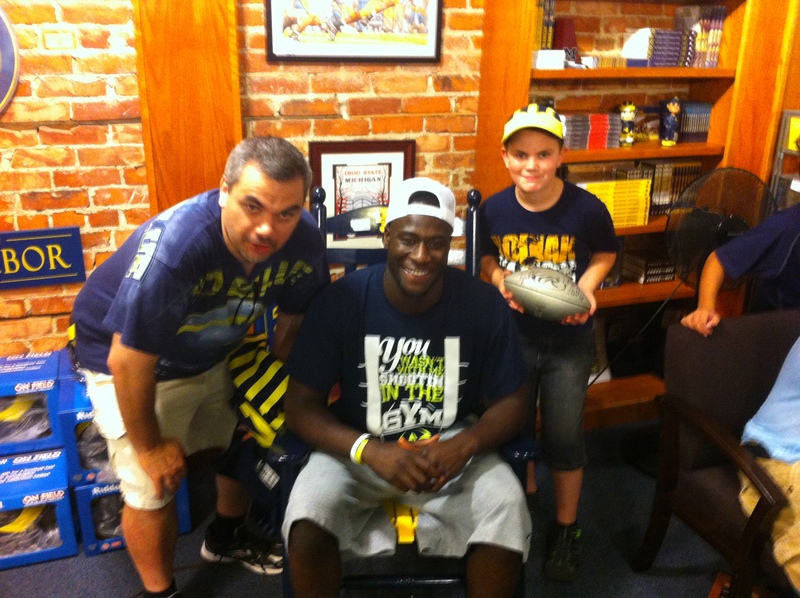 And yes, that is me on the right (viewer’s left) of Devin Gardner. Not too pretty, as you can tell. One of the reasons why you don’t see many pics of me on this site. I hate pics of myself. So enjoy the pics while I contemplate adding NCAA Football 14 to my list of things to get in the near future! A Congratulations to another published writer!! I’m taking my fiction hat off for a moment (Just for a moment, I assure you) and am passing on congratulations to Pastor Jordan Cooper, who has joined the ranks of published book authors with his new nonfiction work. I’ve been following his blog and podcasts for a bit of time now, and have been very impressed with his work, and obviously am looking forward to getting a copy of his new book ASAP. Please feel free to check his site out and enjoy some good writing and podcasting!